As Sweden falls deeper into political chaos and Marxist political control, not only have freedoms been slowly stripped from the citizens of the nation, but terror has become a common and normal experience throughout the now left-wing nation! Now, last Monday morning, yet another terror attack took place against a Conservative politician, as the militaristic wing of Marxist leftists politicians launched an attack on a political candidate who dared question their Marxist agenda! Reports indicate that AntiFa placed explosives to target the home of a former parliamentary candidate for a Conservative Nationalist and his family who is a member of the (AfS) Alternative for Sweeden Party! 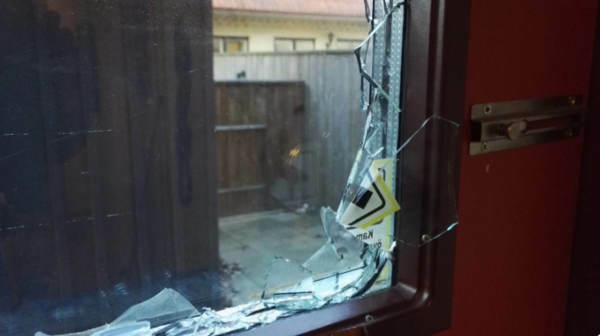 Fortunately, although Peter was at home with his three children during the attack that blew part of his door apart, they were fortunately upstairs when it occurred! The AfS Party that Peter Sweden is a part of is against migration, and opposed to the EU! As a result, it goes strongly against the goals and aspirations of the left-wing Marxists! 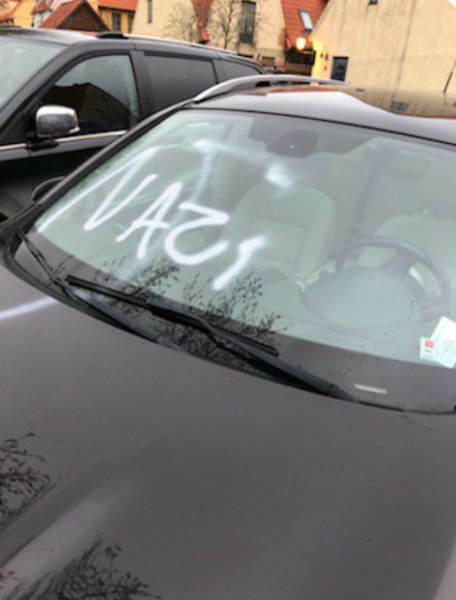 In fact, this is not the first time that the group targeted Sweden, but the first time took place onMarch 22nd, when radicals spray painted “Nazi” and vandalized his car! Sadly, because the radical leftist Marxists control much of the government, the police even refused to investigate the first incident! Also, the incident was suppressed by the left-wing Mainstream Media, as they have been suppressing any news that would paint the Marxists in a bad light throughout Europe! Already, the European Union has continued to move ever-closer to a Marxist or Fascist style Police State, as Facebook granted their pro-Marxist government so-called ‘fast track’ powers to delete accounts ahead of their elections last year! “responsible for issues concerning civil protection, public safety, emergency management, and civil defense as long as no other authority has responsibility. Facebook confirmed to Expressen (one of two nationwide evening newspapers in Sweden) that the social media company has worked with MSB, but they declined to comment further on the matter. However, Sweden, as well as the European Union, is walking down a slippery slope with censorship. Sweden’s establishment media has taken a keen interest in fighting so-called “disinformation” in the run-up to elections, similar to the Establishment or Mainstream Media in the United States. Mainstream Media throughout the whole of Europe and America have become increasingly frustrated as Populist Conservatism and Nationalism spreads and flourishes, thus undoing much of what the Progressive One-World Elitists have built over the past 30-40 years. Populist-Nationalists have had victories in Great Britain with Brexit. Populists-Nationalists have had victories in the United States with the election of President Donald Trump. Since then, the Progressive-Socialists have had trouble gaining traction again that would propel their socialist and communist One-World government ideology. Therefore, while the Mainstream Media is losing the trust of the people in the United States, and throughout much of the world, Progressive’s have begun shifting to more extreme measures. They are trying to silence all non-Mainstream Media voices. All media that does not conform to their ideology. All citizens whose voices oppose their radical ideology are cut-off from free expression. Therefore, as America and the world refuse to conform to their Progressive-Socialist and communist ideology, the Elitists implement the only tactic available…supression of their ‘freedom of speech’. Sadly, as a result of their need for an end to the ‘freedom of speech’, Progressive’s have had to implement ‘police state tactics’. Methods for silencing the majority, as a means to implement the will of the minority. That is the only way that those in power can control the mass populations. That is the only way that they can renew their Progressive-Socialist drive. A drive to empower those who agree with their ideologies, and implement their One-World Communist Imperialism. However, does truly ‘freedom of speech’ subvert Democracy? Does so-called Fake News truly ‘subvert Democracy’? Isn’t censorship of free speech more of a threat to democracy than lies, distortions, and misconceptions? Do Progressive-Socialists and One-World proponents really believe that the non-Elitist populations are too dumb, too stupid, or too ignorant to make informed decisions as to who to trust? Not really! Censorship is about power and keeping that power in the hands of those very same Elitists. Progressive-Socialist ideology, Fascism, and other communist based ideologies all believe that in order to control the masses, the government must control information, and therefore the minds of their subservient masses. Consequently, as the Mainstream Media organizations like CNN, MSNBC, NY Times, Washington Post, international MSM publications, and other MSM outlets began pushing ideology rather than fact-based news. Now, the masses have begun to search out other alternatives in their thirst for truth. Alternative’s like Breitbart News, Gateway Pundit, WND, Washington Times, Conservative Review, Evans News Report and others have become the go-to for more fact-based news. Consequently, Progressive-Socialists, Mainstream Media, and other left-wing ideological organizations have set themselves on a new mission of ending non-Progressive-Socialist, non-One World, non-Communist publications. Mayor Khan responded to the crisis by blaming “Tory” cuts to the police, and claiming the crime was affecting other areas of the United Kingdom. Meanwhile, Amber Rudd, the Home Secretary, has demanded that social media firms censor online content in response to the crime wave, claiming that deleting videos will help save lives. Therefore, once again, the Progressive’s claim the problem is freedom of information, and not the problem itself. They confiscate guns, and then go after ‘free speech’. Reminiscent of communist and fascist regimes of the past, like in the Soviet Union, and Nazi Germany. In addition, the Soviet’s (modern-day Russia) created the Glavlit (General Directorate for the Protection of State Secrets in the Press) which censored all books that were not produced by the Soviet government. The Soviets also moved to ban modern art, and radio broadcast that didn’t originate from the communist-led government. Not only did the communist controlled Soviet government initiate and implement severe censorship guidelines in their country, but the Nazi regime did so as well. The United States Holocaust Memorial Museum reports how Nazi Germany implemented censorship in their country as well. Hitler and the Nazi regime took the country by force, and ended democracy by brute strength, and implemented a One-Party Dictatorship. In fact, contrary to what Progressive’s have taught in schools, fascism is a break-off of communism, but instead of being led by Party rule, it is led by a dictator presiding over a one-party rule. For fascism to be categorized as a far right-wing movement, it would need to fall under the category of anarchy, or the lack of government. Therefore, anarchy is a far cry from what fascism is. Once Germany succeeded in implementing the Nazi’s as the ruling Party, Adolf Hitler took leadership as the furor. Then, Hitler and his Nazi Party began doing what communist and fascist governments do best. They began censoring free speech and replacing the real news and information with ‘fake news’, or propaganda. The Nazi’s orchestrated one of the largest propaganda campaigns in human history, to win the loyalty and cooperation of the people. Joseph Goebbels as head of the Nazi Propaganda Ministry took control of all forms of communication and news including magazines, newspapers, books, public speech, public meetings, rallies, music, art, movies, and radio. Anyone or anything that threatened, or contradicted the fascist Nazi Party was censored, eliminated, and destroyed. The media could no longer report any ‘real news’ stories, but instead promoted the ideological thoughts and beliefs that the fascist leadership wanted the people to believe. In effect, freedom of speech, and freedom of the press, and freedom of thought was effectively dead. To make matters worse, Joseph Goebbels, the German propaganda minister led Nazi student organizations to indoctrinate youth into their way of thinking. They taught the students that all those who oppose Hitler, Nazi leadership, or fascism are a threat, and consequently, they should be removed, and exterminated. Students raided libraries and bookstores across Germany, marched in parades, and tossed the books into a fire, all while chanting joyously. As a result, if the speech wasn’t in line with Nazi Party doctrine, it was banned. If the written word was not in line with Nazi Party doctrine, it was burned. If people were not in line with Nazi Party doctrine, they were eliminated and exterminated. Today, the same parallels can be seen throughout not only the whole of Europe, but in the United States, and around the globe. Progressive-Socialist’s and communists are effectively stripping free speech from the public square with groups that claim to be against fascism but simultaneously promote the fascist agenda. They claim to fight against communism while embracing communist ideological thoughts and ideas. They claim to be fighting for the freedom of speech while fighting to silence opposing thought, expression, and ideology. Groups like Antifa serve as the communist foot soldiers, while College’s serve as their indoctrination breeding grounds for their cause. Just like in the 1930’s Nazi Germany, today colleges strip out factual history and replace it with distorted propagandist concepts that put down America’s history and promote socialist and communist ideologies. In fact, they produce students graduates who have been so brainwashed, that they don’t realize what they are truly fighting for, and what they are fighting against. Many truly believe that they fight against fascism, while they are truly fighting for that very thing…fascism. Then, we have the Mainstream Media who attack anyone who challenges their reporting as ‘fake news’, despite the facts not being on their side. They throw insults at the opposition, call them racist, xenophobic, Islamaphobic, homophobic, or any other phobia that they can contrive. They throw insults, and accusations, but never truly debate the facts themselves. Meanwhile, Facebook, Twitter, and Google censor anyone who opposes the Progressive-propaganda, while promoting the Mainstream Media. They attack the facts by simply stating that it is ‘fake news’ or ‘hate speech’, and call for censorship of the opposition. A tactic that is proving to be more and more difficult for them to defend. The Mainstream Media, Facebook, Twitter, Google, and Progressive’s are ever-increasingly struggling, as common-folk and the so-called ‘deplorable’ are seeing through their shroud of lies, distortions, and deceit. Progressive’s attack all those who oppose their ideology with reverse-psychology. They accuse everyone who opposes them of using ‘hate speech’, as they promote hate. They accuse alternative’s to their Mainstream Media as ‘Fake News’, as they fill newspapers, radio’s, televisions, and social media with false, misleading, and malicious information. They call everyone who opposes their leadership as ‘racist’, yet their own history and record show that they have done more harm to all races than anyone could have ever fathomed. In the end, we live in perilous times, as not only is hate, discrimination, and violence pervading the European continent, but also into the heart of America! We live in a time where ‘Fake News’ is promoted as truth, and where ‘truth’ is promoted as ‘fake news’. We live in a time where ‘racists’ are depicted as the moral authority, while Christians and those who spread love and tolerance as ‘racist’. We live in a time where colleges and institutions of education promote indoctrination rather than education, resulting in a society of misinformed and indoctrinated graduates while allowing the blue-collar workers to be more able to make educated and rational decisions. In fact, in an ironic twist of fate, it could be the untaught, the unschooled, the unscholarly, the unsophisticated, or as the Progressives like to call them, the ‘redneck’ or ‘deplorable’ masses that save us from the indoctrinated-Elite. Yes, in the end, it could be those who chose a simpler life, that truly makes wise decisions. They could be the ones who save America, and potentially the world from repeating the mistakes of the past. They could be the ones who stop the United States from embracing a communist or fascist ideology, in favor of freedom. Now, just as the British misjudged the American colonies in the 1700s, by believing they could crush the ‘rabble of farmers with pitchforks’, Progressive-Socialists have misjudged the huddled masses of non-college educated ‘deplorable’s’ who are rejecting the Progressive-Socialist stranglehold on our constitutional republic. In fact, it is the people’s blatant rejection of Progressive-Socialist ideology, combined with the Mainstream Media’s blatantly dishonest ‘fake news’ reporting, that propelled Donald Trump to the Presidency in 2016, and continues to propel him in popularity. It was the ordinary British citizen who grew weary and tired of the Elitists in Parliament, that voted to have Great Britain exit the Socialist driven European Union. Furthermore, it is the bald-faced lies, distortions, arrogance, and condescending attitude of the Progressive-Socialist Elite, towards the common, hard-working, blue-collar workers, that will drive America back from the brink, and towards a constitutionally conservative nation, yet again.